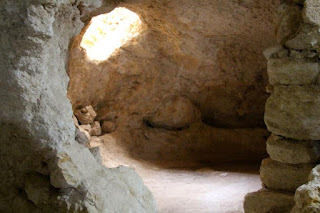 A cave of soft white limestone typical of the Galilee. AN OLD ENVELOPE turned up in a book donated by Sister St. George Skurla, CSJ, one-time head of the English Department. Dealing with old envelopes is kind of why archives exist, so it made its way to us this morning. Even in an archives full of wonderful surprises, it's not every day you see something like this. In the envelope was an original typewritten letter dated June 1, 1964, and signed by the mayor of Bethlehem -- the Bethlehem, not the one in Pennsylvania. It was written on the letterhead of the "Hashemite Kingdom of Jordan" and attested to the authenticity of an archaeological dig in late 1963 in the Holy Land, during which some amount of rock was excavated from the site of the 4th Century Basilica of the Nativity, believed by Christians to be the location of the stable where Jesus was born. Mr. Stanley S. Slotkin, the letter went on, obtained some of the rock with the idea of sending it back to museums and churches in the United States, "with the conviction that these stones will create interest in all faiths." The rocks were shipped, the mayor confirmed, accompanied by a letter of authenticity similar to the one we held. At the name Slotkin we perked up. We've seen Stanley Slotkin's name elsewhere in the Mount Archives, usually associated with one of our treasures. He was the founder of Abbey Rents and seems to have spent part of his fortune donating rare books, whole collections of books, paintings, and illuminated manuscripts to colleges, universities and museums in the United States. Slotkin, who died in 1997, was on a pilgrimage to the Holy Land in the winter of 1964 when he decided to start giving away Bethlehem stones. But there was more in the envelope. we pulled out a shiny black card with magenta trim and white lettering, and glued in the center was a tiny white rock labeled "Stone from Bethlehem's Cave of the Nativity, Manger Room." At that point we confess to goosebumps. Manger Room? The rock -- pebble, really -- is chalky and soft, which is what made digging caves for houses, inns and stables so popular in 1st Century Bethlehem. But this particular little piece of Palestine geology, tradition says, saw the birth of the Son of God. We held in our hand a bit of calcareous rock that is a souvenir of the Incarnation. It's on our desk, with Mayor Elias B. Bandak's letter. As we work through this third week of Advent, we will have in front of us a piece of the cave to which Mary and Joseph resorted when they were turned away at the inn. Mary gave birth to her divine Son in that cave, and perhaps some of the light of that Holy Child and those choirs of angels and the light of the Star glinted on this little rock. What to do with it? We suppose we'll add it to the collection of other treasures Slotkin donated -- some sheets from books of hours, a fragment of a 12th Century Quran. Seems strange, though. Maybe that's why Sister St. George tucked it into a book, to be forgotten for the next 46 years. What do you do with a souvenir of Ground Zero in a cosmic shift in the universe? Great piece, Vicky. I feel what you felt. I especially like the last line. Excellent writing and economical storytelling. Thanks, Paul. Your comments made my week. So come and visit the Manger Rock (pebble). I'll be on vacation for a couple weeks but it'll be waiting for you Jan. 3, 2011! Finally, Dianne and her family were just thrilled to have read about this find, so I deeply thank you for posting this! I am sure she would love to hear more about this find if possible. Thank you! p.s. I am using my husband's google account to post, but I can be reached on my website or through my e-mail jenniferranney@yahoo.com. Thank you again so much for posting this! which talks about his travels and donations. Not sure what else may come of that little rock, but we'll see. It's turning out to be remarkable already.